I guess, Every or Most of the mobile phones are Bluetooth enabled present in the market. Along with this, If they are also providing internet access too in the phone, You can use your mobile data connection in your laptop also using the Bluetooth. If you`re not an android user and have a Bluetooth and internet access enabled phone, then this guide is for you specially. Wait! If you`re an android user and want to access internet on your laptop using mobile data connection, you should see Use Your Android Phone as Modem or Wi-Fi Hotspot. (Click on the link to get step by step guide). 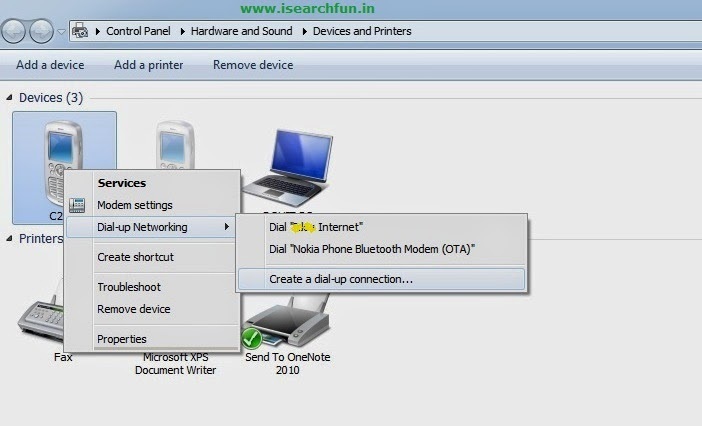 Also, if you`re Nokia user , you should see Connect Computer to the Internet Using NOKIA Phone. Okay! Now, the point is what actually you have to do? Follow some easy steps, nothing else. First of all, Turn on the Bluetooth in both the devices i.e. your phone and laptop. Now, Pair the phone and the laptop. After the successful pairing of both the devices, do the same as mentioned below and have a look on the image to get better idea. You`ll see many devices appeared here, if ever connected to your laptop. That`s all. If you are successful in your try, you`ll found yourself luckier one and Enjoy the surfing on your laptop. Yeah! Internet speed might make you disappoint but well! Don`t be disappoint. Great Job Sir jee. Nice post who use mobile for internet.